Dog Training should be fun for both you and your dog. The following few simple tips can help when starting your dog training. First - Make sure you give yourself ample time during the day to train your dog. Make sure you will have uninterrupted time so that your dog stays focused during the duration of training. Your dog's attention span will be limited to start with so make sure you give your dog full attention during that time. Take the time the next few weeks to work on just these so the dog isn't too overwhelmed. Using one-word commands usually works best when training your dog. For instance, SIT, COME, PLACE, STAY, OUTSIDE. Third - Use treats. Treats are a great way to get your dog to do the things you ask. Once they obey a command, give them a treat and praise him. Fourth - Keep training anywhere from 30 min. for 1 hour. 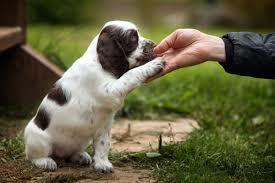 Remember a dog's attention span is somewhat short, so you must keep it short and direct. Fifth - Do not punish your dog when it does not obey your commands. Remember this is a learning process for you and your dog. A dog needs to be rewarded for obedience. When teaching your dog to sit, use a treat and put right above the nose. Say SIT. As he/she tries to get it, move the treat towards the dog's rear. As the dog moves back, push the rear down. Every time he/she sits give it the treat and praise. When teaching the dog to come to you, use a color and rope. This may require two people. One to hold the dog at a distance and you on the other side. Have a treat in hand and the end of the rope in the other. Make sure to have at least 15 feet of rope. Say COME. Give the rope a good tug, as the dog moves toward you, pull the slack. This may require a few tugs in order to get the dog all the way to you. When the dog gets to you, give the treat and praise. When teaching the dog to go to a place, use treat and a short rope. You can use any object close enough to the ground that the dog can climb up on (cot, folded blanket, pillow). Say PLACE and pull the dog onto the object used by the rope. Once the dog is on the object, give the treat and praise. When teaching the dog to stay put, get them to first sit. After they sit, say STAY and start walking away slowly continuing to say stay. If the dog moves, start over. When you are able to get about 5 feet away, give the dog a treat and praise. When teaching the dog to go outside to use the bathroom, take them outside routinely. When the dog uses the bathroom outside, give them a treat and praise. When the dog uses the bathroom inside, show your disapproval by saying NO. Just make sure you do this only when you see the dog has just used the bathroom (immediately after). This will not work if you find a mess later because he/she has already forgotten about using the bathroom. After saying no, you must immediately take the dog outside to show them that is where they are supposed to go. After continuously doing this, he/she will recognize what to do and will start to go to the door.